Honda Marine BF15 - 25 in. The BF15 and BF20 are as convenient as you can get. At just 104 pounds, they are among the lightest in their class. Yet they‘re all Honda DNA: quiet, reliable, fuel efficient, and loaded with features. Like the highest output charging system in their class, giving you plenty of power for all your electronics, even when trolling. Or large displacement for a powerful performance. Choose the BFP Power Thrust design for even more boost, with 60% more thrust in reverse and 15% more in forward. Add in easy one hand starting, shallow water drive, power tilt, and much more, and you’ve got the ideal combination of power and portability. Large Displacement - better performance: At 21.4 cubic inches, the BF15 and 20 have one of the largest displacements in its class. Along with the long-stroke design, this provides optimum torque throughout the RPM range. Easy One Hand Starting: A built-in decompression release and digital CDI system set the BF15 and 20’s ignition timing. This reduces the effort required to pull-start the engine by hand by 40%! Lightweight Design: The lightest 4-stroke model in their class, the BF15 and 20 are easy to transport and convenient to mount. Available with Power Thrust Design (BFP) - better performance for heavy loads: The 10" x 7 5/8" Power Thrust 4-blade propeller creates 60% more thrust in reverse and 15% more in forward. The result? Improved maneuverability and performance. Reverse Exhaust Relief - increased manueverability (BFP models): The exhaust relief feature creates more power in reverse by minimizing cavitation around the propeller blades. The exhaust relief is located above the cavitation plate, allowing the prop to run in clean, exhaust-free water. High Output Charging - more power! : The BF15 and 20 have the largest alternator in their class. These motors generate 12 Amps at only 3000 RPM. This helps to maintain battery charge and keep electronics running at trolling speeds. Longer Tiller Handle - better control: A convenient longer tiller handle improves control and reduced steering effort. The extended handle is made of a lightweight composite, increasing its durability while decreasing the motor's weight. Pendulum Mount System - Smooth operation: Honda's exclusive triangulated rubber mount system absorbs vibration and provides unbelievably smooth operation. Convenient, Up Front Tiller Controls: A convenient front-mounted shift lever allows fingertip shifting. The Twist Grip Throttle & Tensioner minimize driver fatigue. 3 Stage Carburetion - better fuel economy: Conventional 2-circuit carburetors go directly from a lean mixture at idle to a rich setting at full throttle. The BF15 and 20 add a third stage for better economy and smoother operation. Power Tilt: Conveniently allows user to tilt the unit out of the water. At low speeds acts like a power shallow-water-drive device, permitting access to the shallow water areas. Available in 15 and 20 inch shaft lengths: Power Thrust models are available in 25" as well. Trim Range: 4 Stage 8 deg.-12 deg.-16 deg.-20 deg. Diameter x Pitch, Standard: 9¼ x 10 in. Diameter x Pitch, Power Thrust: 10 x 7-5/8 in. Overall Width: 350 mm/13.8 in. X Type: 635 mm/25 in. California Prop 65 Information Marine Outboards: WARNING: This product can expose you to chemicals including soots, tars, and mineral oils, which are known to the State of California to cause cancer, and carbon monoxide, which is known to the State of California to cause birth defects or other reproductive harm. For more information go to www.P65Warnings.ca.gov. 4 Stage 8 deg.-12 deg.-16 deg.-20 deg. *At participating dealers only. 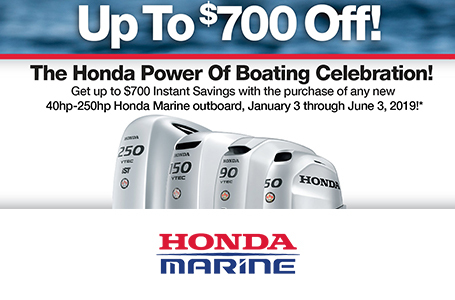 Qualifying retail customers may receive instant savings off the selling price of a Honda powered boat package or Honda Marine engine(s) sold for repower. This promotion is limited to new Honda Marine 40 HP through 250 HP outboard engines, 2014 and newer models, sold and delivered between January 3, 2019 and June 3, 2019 and registered by the Dealer in accordance with American Honda Motor Co., Inc.’s sales registration requirements. 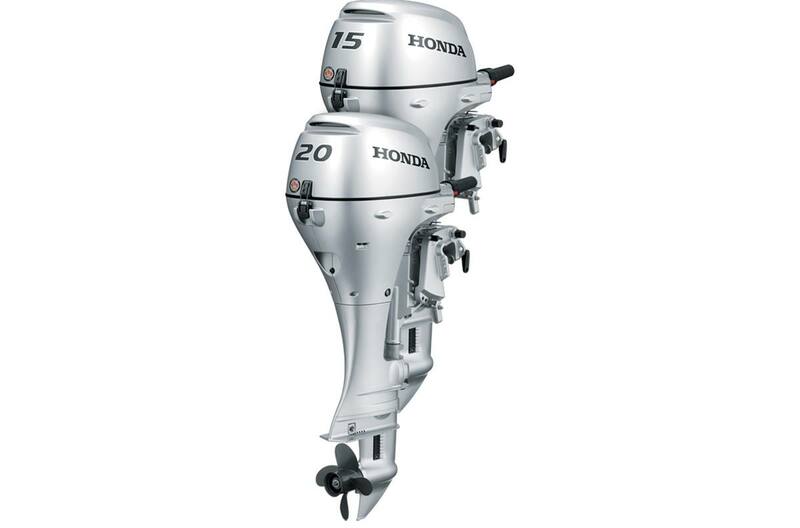 Only Honda Marine outboard engines sold for personal use qualify for this promotion. Fleet, commercial & government sales are ineligible. Engines sold under special pricing / promotions including (but not limited to) demo and tournament fisherman engines are also excluded. Honda Marine reserves the right to modify, amend, cancel or revoke, in whole or in part, this promotion at any time without prior notice. **Boat Show Only savings promotion can only be applied to eligible units sold by an Authorized Honda Marine Dealer at a regional boat show and delivered to the customer by March 31, 2019 and registered by the Dealer in accordance with American Honda Motor Co., Inc.’s sales registration requirements. Only units sold for personal, non-commercial use qualify. Units sold by Honda Marine under special sales programs, including Fleet Sales, Demo or Tournament Fisherman program are NOT eligible for this promotion. © 2018 American Honda Motor Co., Inc. Always wear a personal flotation device while boating and read your owner’s manual. 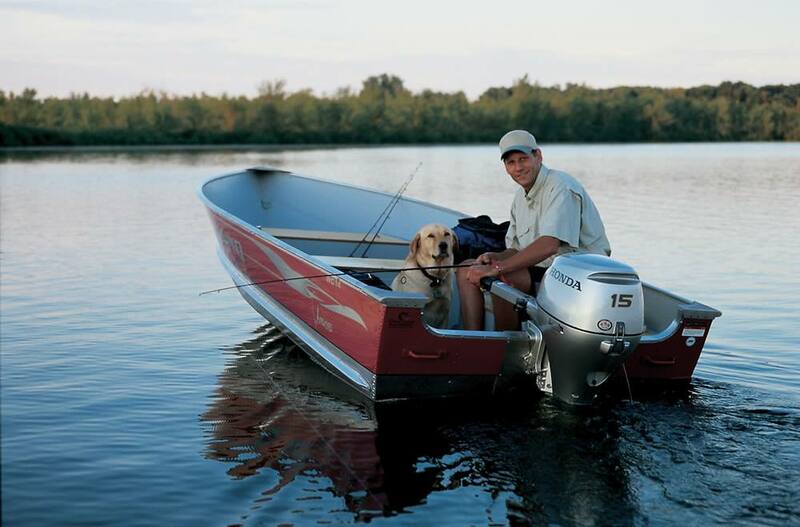 All Honda outboards meet EPA and CARB emission levels. Honda Marine BF15 - 15 in. Honda Marine BF15 - 20 in. Honda Marine BF2.3 - 15 in. Honda Marine BF2.3 - 20 in. Honda Marine BF20 - 15 in. Honda Marine BF20 - 20 in. Honda Marine BF4 - 15 in. Honda Marine BF4 - 20 in. Honda Marine BF5 - 15 in. Honda Marine BF5 - 20 in. Honda Marine BF6 - 15 in. Honda Marine BF6 - 20 in. Honda Marine BF8 - 15 in. Honda Marine BF8 - 20 in. Honda Marine BF8 - 25 in. Honda Marine BF9.9 - 15 in. Honda Marine BF9.9 - 20 in. Honda Marine BF9.9 - 25 in.